Damian Killeen: Good evening, everybody. My name is Damian Killeen. I am Chair of something called ‘Big Things on the Beach‘. I am here as a local resident of Portobello which, as some of you might know, is a community on the fringes of Edinburgh, down by the sea. As a local resident, over the years I have joined in lots of conversations with people – friends and neighbours – about what Portobello needs. Portobello needs a bistro; Portobello needs a bit more vitality; it needs a bit more recognition as part of Edinburgh – those are the kind of conversations that have gone on in our community. 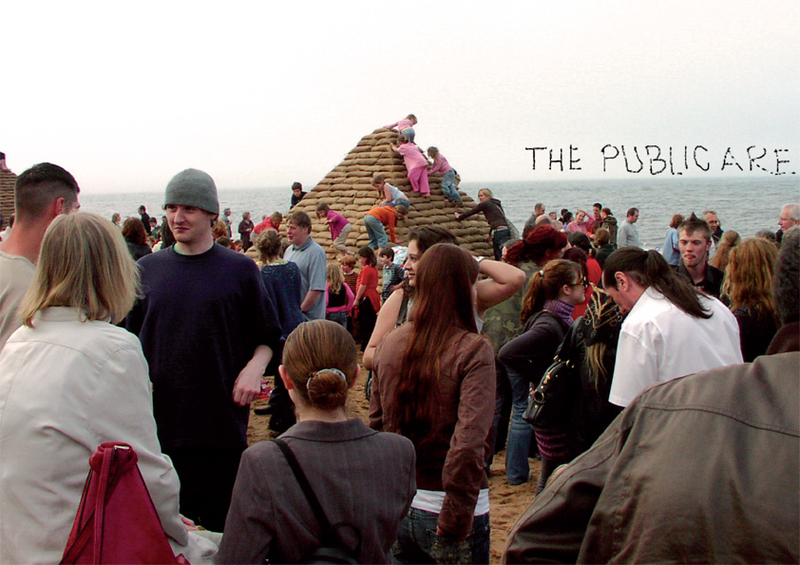 In 2003 I took an initiative to bring together a group of people and said, ‘Shall we try and turn some of these conversations into something?’ and after a few discussions we decided that we would form a public art trust, the purpose of which would be to commission artists to come and work in our area. Since 2003 we have made three commissions. What you are looking at here, is the launch of the most recent of those commissions, a work called Wonder by Hill Jephson Robb who constructed three substantial pyramids out of sandbags. He invited the community to fill the bags. Some of the community misunderstood the invitation and thought they had been invited to empty them – so there was a kind of creative tension during the whole process of the construction! What you are looking at is the evening of the launch event which brought out one of the largest collections of people that anybody could remember on Portobello beach. Many of these people felt that they had a real connection with the work of art, because of having helped to make it. That sums up the idea that was at the heart of the vision of the artist who wanted to bring people together around an aspirational project. The idea that we can aspire, that we can realise our aspirations and that we can change our environment in creative ways is also at the heart of what we are trying to achieve with Big Things on the Beach. When we say we are commissioning works of art, we are not talking about ‘community art’ in terms of employing artists to help the community express their own ideas. We invite artists to engage with our community and our brief is always to invite artists to come forward with ideas that will excite us and challenge us in relationship to the social, economic and environmental dimensions of our community. We invite artists to take risks with us and we share those risks with them. It is very important to us that we are people from the community who are taking the lead in this. We are not looking to other agencies to tell us what to do or how to do it. We do look to other agencies to help us with the resources – and since Amanda Catto is sitting here, I will say, that we are very grateful for the support of the Scottish Arts Council for providing the funding to enable us to do this. So, the public are our neighbours. That is a very important dynamic for us because, having taken an initiative within our community, we are in a relationship with the wider community and we feel very, very, accountable for what happens. Our public is very diverse, they are totally unmanageable and uncontrollable. We cannot predict their responses to the artworks we commission. You can see from the poster that many of the public are not looking at the work of art but are talking to each other and some of them are using the artwork for purposes other than we initially intended – but that is how it is in our community. Later this year we will hold our second Imagine Portobello event where we will invite members of the public to come and talk with us about public art in our area, and that discussion will lead us forward to whatever will be the next stage of our development.